Long-time friends, Martyn Botfield and Ted Fox, are looking for a change of pace and career shift by joining forces in farming. Their plot at New Entry's Ogonowski Memorial Fields Incubator Farm, combined with a personal farm property in Concord, MA, sets them apart from other New Entry farmers. 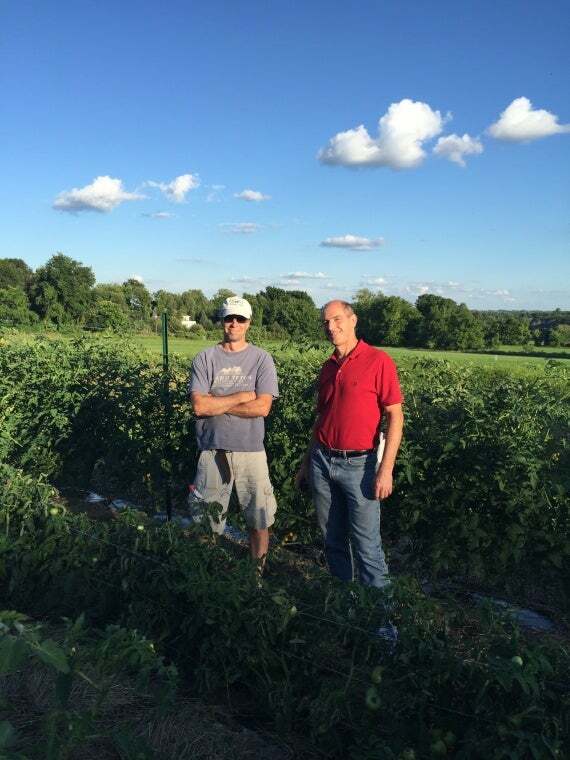 In the midst of their first season, Martyn and Ted are experimenting with numerous strains of tomatoes and lettuce to benefit their future business. They want to maximize their efforts by extending their growing season as much as possible and determining what customers like best. Currently, they have planted 72 varieties of salad greens to observe the germination and growing rates with varying temperatures and time of the season. Both Ted and Martyn's families are very supportive of their farm endeavors and love it when they bring work (the fruits of their labors) home with them. Ted takes home multiple types of tomatoes for taste testing and his family serves as the judge for the best tomato. I was lucky enough to taste test as well. Despite their full-time jobs, families, and commute, their first season has been progressing with much success. They have expanded from their two quarter-acre plots into an additional row in the greenhouse at New Entry's incubator farm. New Entry's World PEAS Food Hub, local food banks, and their families have been enjoying their accomplishments. In the future, they hope to be farming on 5 - 20 acres to make this their sole source of income. A year-round business and expanding into a wholesale market is their goal. With the quality of products, careful attention to detail, and innate passion they are showing in their first season, we are confident they will succeed! Update: New Entry's Farm Land Matching Coordinator Noelle Fogg Elibol was able to match them with a 12-acre parcel of land in Acton-Boxborough in the Spring of 2016! This land, now known as Dancing Plover Organic Farms, was strategically matched with Martyn and Ted to be close to their homes. Ted and Martyn are focusing on selling to the wholesale market. With 12 acres their plan is to use ⅓ of the land for cover crops and ⅔ for production. Given that Ted and Martyn were just matched with this land this spring, they have spent most of this season preparing for the transition by planning and acquiring infrastructure – a pond irrigation system, tractor, and greenhouse. They plan to get farming on their new land in 2017. As farming can be challenging, Martyn notes success is achieved by the “willingness to adapt to change you can’t forecast.” They already feel incredibly successful and are very appreciative of New Entry’s support and opportunity. Martyn and Ted have lots of enthusiasm and support for young folk in the farming business. Yet, during our interview, Martyn begged the question of how do young folk (who are the future of sustainable agriculture) get started in this physically demanding business where the capital cost is so high? As New Entry does, Dancing Plover Organic Farms aims to reduce the hurdles for youth with the aspiration to farm. They hope to build a sustainable business and a well-accepted brand. One that supports an additional one or two younger farmers to hand Dancing Plover Farms off to and continue their legacy in the future.